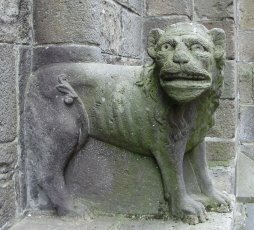 In the 11th century basilica in the center of town, Rue Notre Dame, Puy-de-Dome department, Auvergne, 13th century, 114 cm. Because she was mutilated during the Revolution and patched back together, her body is made of walnut wood, her arms of pear wood, and baby Jesus of oak, then all was painted uniformly black. One evening around the year 507 A.D., Théodechilde, daughter of the Merovingian King Clovis saw a great light in a nearby forest. She headed for that place and drew near in time to witness a gathering around a sacred stone. (*1) By the time she arrived on the scene the only ones left were a statue of the Virgin Mary guarded by two stone lions. This was clearly a sign that Mary was to take the place of the goddess Cybele, whose presence on earth was a sacred stone and who was usually accompanied by two lions. The torch of the Great Mother, Queen of Heaven, had been passed on to the Virgin Mary. Though the log of Our Lady's many miracles was burnt during the Revolution, people still remember some of them. They say she stopped a devastating period of rains in 1816 and the cholera in 1832. During the Crusades two French men were captured in the Orient and chained in a dungeon. When they implored Our Lady of Miracles for help, she transported them, during the night, in an instant to Mauriac. Their irons can still be admired as ex-voti in the church. By the 11th century, so many pilgrims flocked to Our Lady of Miracles that a bigger church was needed. (Even St. Dominic spent two days at her feet.) Yet the local priest was more concerned about enlarging his own house than the house of God. When he tried to do so by infringing upon the garden of the Queen of Heaven, she struck him and two of his workmen dead. In order to appease her wrath, the present day basilica was quickly erected. Throughout the Middle Ages, people wanted to be buried as close to an altar or holy place as possible, in order to ensure their soul's salvation. Hence a great cemetery grew up around the church of Mauriac. Religious plays reenacting Biblical stories were held in it and a rare lantern of the dead still stands there to this day. (*3) People used to light a candle in it each night to guide the newly deceased on their journey and to announce to the community that someone had died. Similar, though much bigger 'lanterns of the dead' remain in the Dordogne region, e.g. in Atur, Coussac Bonneval, and Sarlat. Yet much of what certain authors call "secret, esoteric knowledge" is perfectly mainstream. E.g. baptism is routinely referred to as a 'Christian rite of initiation' in which the old self dies with Christ and the new self resurrects with him. The teachings aren't hidden, though the words are "self-secret" in the Tibetan sense, i.e. meaningless for those who haven't prepared spiritually to hear their transformative message. What is much more interesting in this church is the local saint who is honored there. It is Blessed Catinon Menette, a poor French peasant woman who lived an exemplary Christian life. During the Revolution this nun accompanied the parish priest to the guillotine, not heeding the insults and threats to her own life. That's why she is portrayed with a cloth stained with the blood of the priest. But why is she portrayed as brown skinned when she was a white woman? "Just the style that imitates Byzantine icons. It means nothing," says the present parish priest. Yet, the priest who was killed is portrayed in another icon of the same style and his skin is white. So maybe the icon writer's intent was to portray her as a devotee of the Black Madonna who took on some of her divine mother's characteristics. Like Mother Mary and Mary Magdalene she stood by the priest through the darkest part of his life and death. She exposed and opened herself to the challenging darkness of the world and the nurturing darkness of the Divine, and it rubbed off on her. You, Our Lady, to you we sing! You, Our Lady, to you we pray! You who touches the cross. You who stands in joy. *1:" Notre Dame des Miracles: Mauriac, cite de la Vierge" a booklet published by the parish of Mauriac and available in the sacristy translates "Saint Peter" instead of sacred stone. Since Peter means stone or rock, I guess the true meaning has to be determined by the context and is subject to interpretation.